Disclaimer: As stated on my about page, I work as a staff interpreter for the European Commission. This post aims to be a summary of the facts and the current situation and intends to provide some background. It is written in a purely private capacity and in no way represents the Commission’s official position nor does it engage the Commission in any way. Apart from the immediate economic and political fallout, one aspect received a fair bit of attention, even in the run-up to the referendum: the role of English in the European Union. First, the facts. English has been an official language of the EU since 1973, when the United Kingdom joined the club. And the legal base for this is one of the first European legal acts ever, regulation 1/1958 (PDF). (On 1 April, Berlin-based American journalist Dave Keating published an excellent tongue-in-cheek article about this French desire to restore the historic role of French in EU circles.) In my part of the Twittersphere, there were many similar postings, most of them by French tweeters, but not only. And the media have taken a particular interest in the topic after Polish MEP Danuta Huebner said English would disappear from the EU as an official language after Brexit. While Huebner also acknowledged English's dominating role within the Institutions, her remarks caused quite a stir. The above-mentioned EU regulation on languages stipulates that official languages of a member state are also official languages of the EU. Huebner implies that this is limited to only one, and that it needs to be notified by the member state to the EU - but at least my preliminary research has not dug up a legal base for that (it may be hidden in the Parliament's rules of procedure). English is not only the language of the UK: Ireland and Malta are also English-speaking countries. 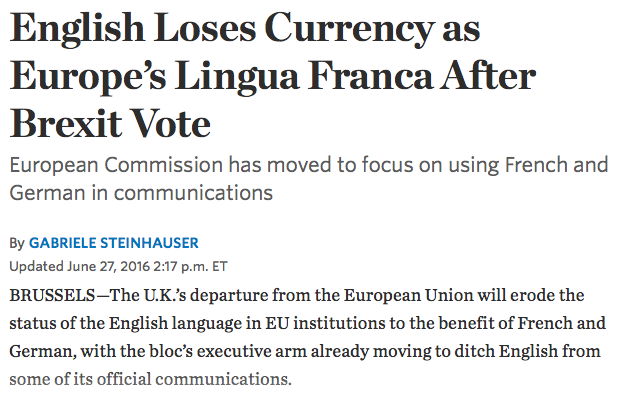 But since the UK had already "notified" English, they respectively added Irish and Maltese to the mix. Irish is actually the first official language of the Republic of Ireland (although Polish has more speakers there than Irish), and the country has been quite active in recent years to give it a stronger foothold in Brussels, Luxemburg and Strasbourg. A derogation from 2007 that exempted the Institutions from providing full coverage for Irish has come to an end, and a recruitment procedure is currently running to hire Irish linguists. The truth is - and Keating wrote this in his article back in April - that the role of English in the European Institutions (and the EU as a whole, for that matter) is much bigger than politics would have you believe. It is the lingua franca of EU officials, and some might even say that EU English has become a language unto itself - just look at this 66-page black book of misused English words and expressions in EU publications (PDF), written by a translator at the European Court of Auditors. "English has already been repurposed as the transnational language of multinational corporations and international business. So, we have not seen the beginning of the end of English as a transnational language and it may well thrive for a long time to come. What we have seen is another nail in the coffin of native speaker supremacy."